You may still be able to book by calling the hotel at 972-398-0135. Located in Plano, Extended Stay America - Dallas - Plano Parkway - Medical Ctr is in the suburbs, within a 15-minute drive of Mary Kay Museum and The Shops at Legacy. 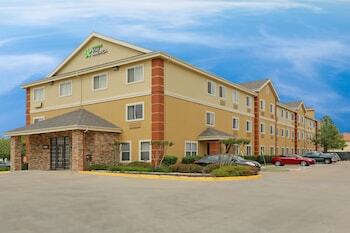 This hotel is 4.1 mi (6.6 km) from Shops at Willow Bend and 4.3 mi (7 km) from University of Texas at Dallas. Featured amenities include laundry facilities, a safe deposit box at the front desk, and an elevator (lift). Planning an event in Plano? This hotel features 0 square feet (0 square meters) of event facilities. Free self parking is available onsite. Extended Stay America - Dallas - Plano Parkway - Medical Ctr is a 2.5-star hotel located at 4636 W Plano Pkwy, Plano, TX 75093, US . Its nightly price usually falls between $53.49 per night and $110 per night, excluding tax, depending on room category. $53 per night found for a Queen Studio - Non-Smoking - single occupancy - Non-refundable room type. 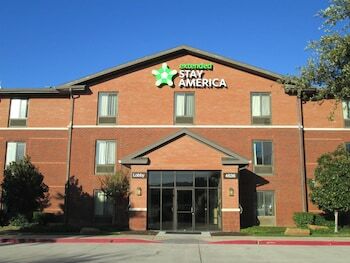 Extended Stay America - Dallas - Plano Parkway - Medical Ctr sells rooms through sites like Room 77, Expedia, Hotels.com, GetARoom, and many others. Room 77 searches across dozens of different sites to find the lowest discount rates available. The lowest rate we've seen over the last few weeks was found on Room 77. In 1% of the cases we surveyed, all sites offered the same rate. You can compare real-time rates from all of these sites on Room 77. Room 77 is the only hotel shopping site that includes special discounts like AAA, senior, government, military, and corporate rates.